There is no doubt that every parent wants the best for their kids. But when it comes to choosing different products such as baby car seats, strollers and hand carriers, every parent must think economically and save while spending. Now, the best way to save while spending when gearing up with baby gear is to focus on convertible products. In other hands, choose products that can change and give you multiple uses. One of the best (convertible) baby gear is a travel system. If you don’t have a clue what it is, the best way to explain it is as a multifunctional stroller that can also be used as a baby hand carrier – or a baby car seat. With a baby travel system, you are getting several products at one cost. However, not every travel system is as reliable as you would expect it. There are ones made of lower – and ones made of high quality. Below, we are listing the best travel systems in 2018. The Chicco Bravo Trio travel system is one of the best selling products out there and the perfect example of an elite travel system in 2018. Made of quality materials and designed to make an easy transition from a baby car seat to a travel system, it is a product that is quick and secure. Most importantly, it is a travel system that doesn’t need any additional adapters for it. 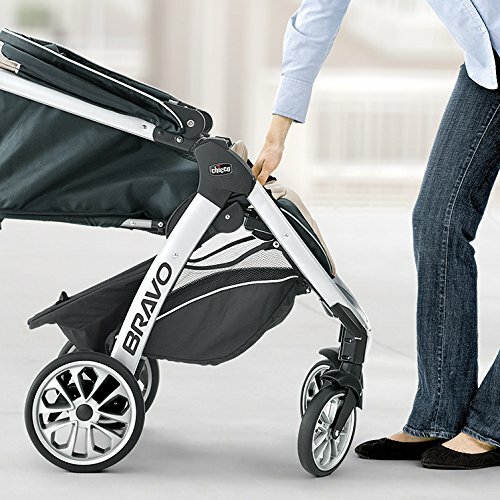 With features such as removable and adjustable canopy, a large basket under the seat for storage, easy to use single-action brake and an adjustable handlebar, the Chicco Bravo Trio is a narrow system that easily fits through tight spaces. What also makes this travel system great is the fact that it is easily removable. This means that you can snap the infant car seat onto the frame or the toddler seat – whatever you prefer. You can recline the seat at the touch of a button and make the most of every single function. The actual ride of the Chicco Bravo Trio Travel system is magnificent. The product uses foam-filled wheels which are great for strolling around the city – and an all-wheel suspension which absorbs shocks and makes your little one’s ride comfortable and smooth. One of the functions that users love in the Chicco Bravo Trio travel system is the compact fold option – designed for parents who have small car or don’t have much space in their homes. With this small fold, the stroller is easy to store and transport. And when it comes to the infant car seat, it perfectly clicks onto the stroller and car base making this one of the best infant seats and travel systems on the market. 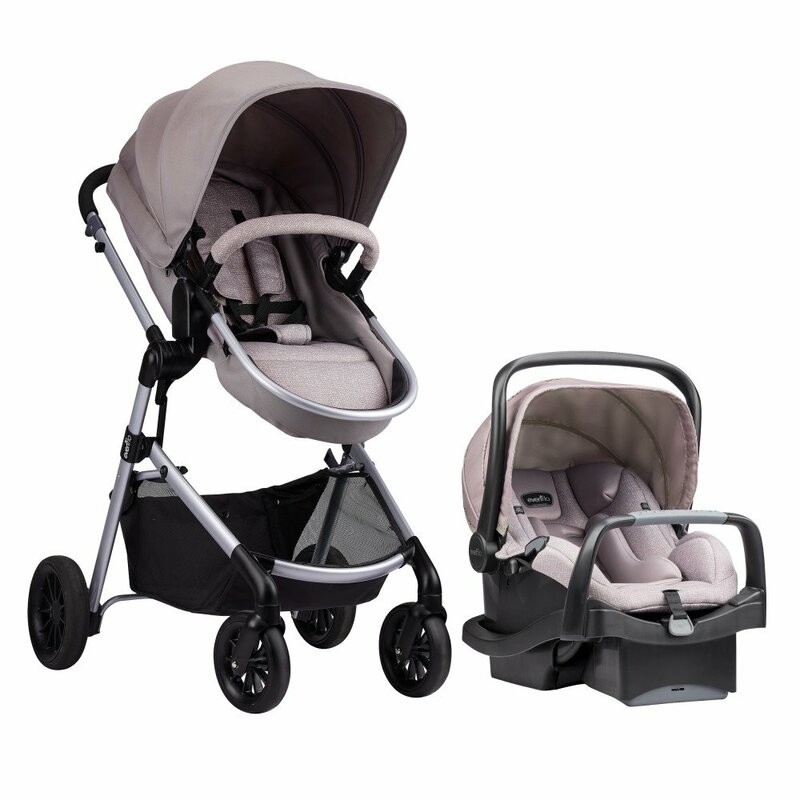 All in all, the Chicco Bravo Trio Travel System is a product from a well-known brand with many reviews online. Despite the minor flows such as the poor performance on dirt roads and the sun shade which is sometimes hard to adjust, there are no major disadvantages of this travel system. 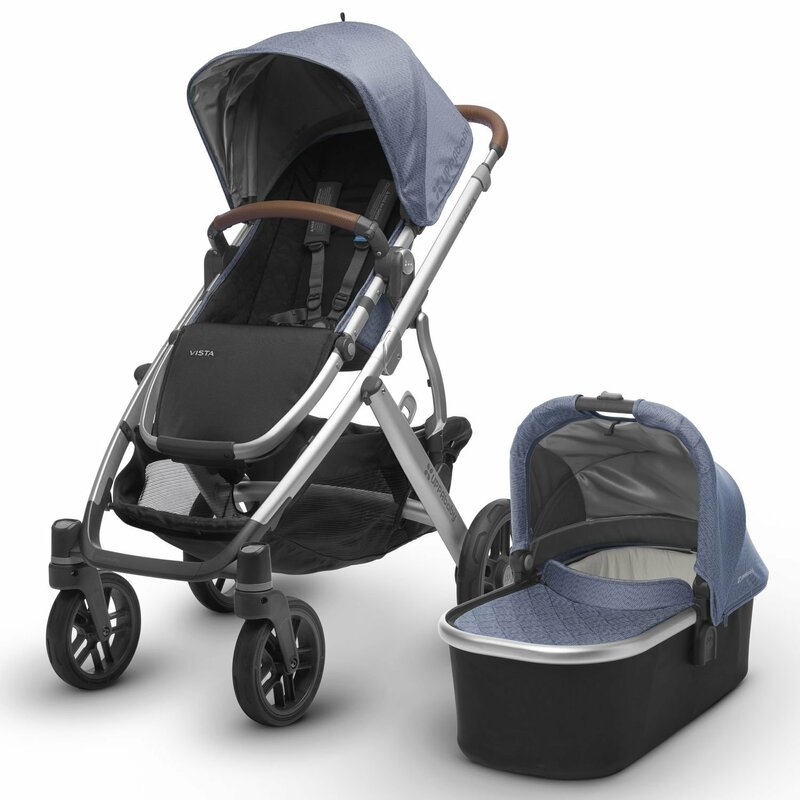 The Evenflo Pivot Modular travel system is among the most elegant strollers out there. The design is what catches your eye at the very first glance – and something that sets a benchmark in the niche. Basically, this travel system by Evenflo has an attractive price. It comes with an Infant car seat which can seat kids from 4 to 35 lbs. The toddler seat, on the other hand, can accomodate children up to 50 lbs which makes it reversible and universal. What’s great about this product is the fact that the child can ride and watch surroundings or look at the parent. You can configure the stroller in both ways and be sure that your baby has a smoothless and bumpless ride. Because of the two-direction approach, the Evenflo Pivot Modular travel system is among the favorites on the market. Wheel-wise, this travel system again exceeded our expectations. The specially designed Cruiser Tires are amazing. 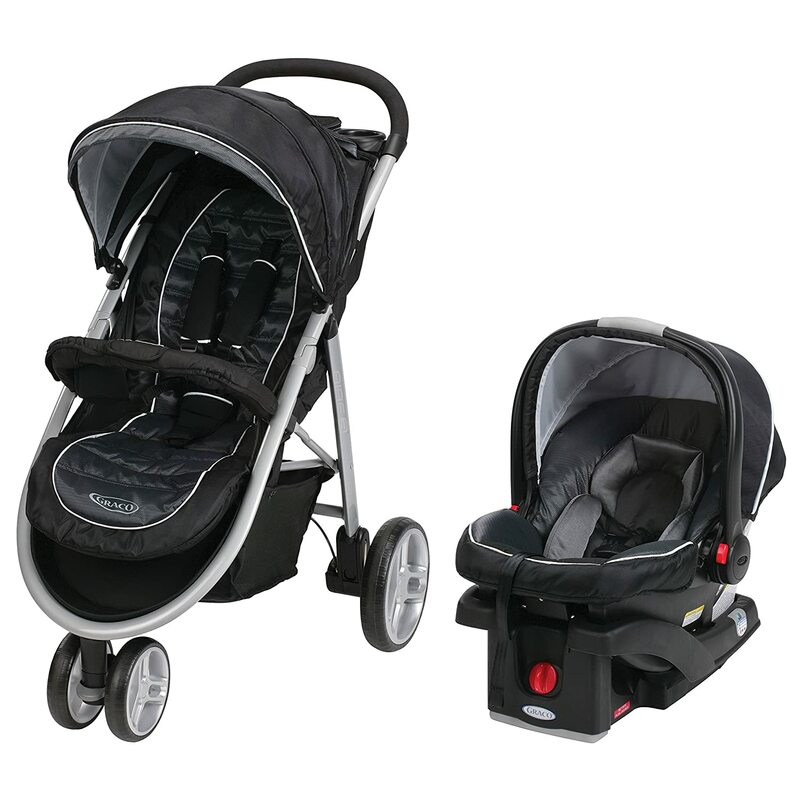 They let you push and navigate the stroller easily and more importantly, offers easy control of the stroller. The infant car seat is also very light in terms of weight which makes carrying it a breeze. Installing it is also easy – the transition from a stroller to a car seat takes just a few seconds. The frame, on the other hand, is easy to fold too and doesn’t take up so much space in the trunk. If there has to be one disadvantage, it is the design of the wheels which is wide and makes the stroller hard to get through slim doorways. Among the other practical add-ons in this Evenflo travel system are the canopy which gives you a full coverage on sunny or windy days and makes you sure that your baby is protected at all times as well as the fact that the seat can convert to bassinet (saving you a lot of space). If you are looking for the Ferrari in travel systems, this has to be it. UPPAbaby VISTA Travel System is the name of the product that gives you three different functions – and one of the best travel systems that looks amazingly stylish and chic. Despite the fact that this travel system has a saltier price, it is one made of long-lasting materials and a great structure. Moreover, it provides versatility and multifunctionality with tons of useful features. But how awesome actually is the UPPAbaby VISTA travel system? First of all, you should know that this travel system can even be used for two or three kids. The structure is great and features rubbered, foam-filled wheels and an all-wheel suspension which altogether provides a really nice and smooth ride. Even though VISTA is an everyday stroller, it got a high score on rough terrains too. 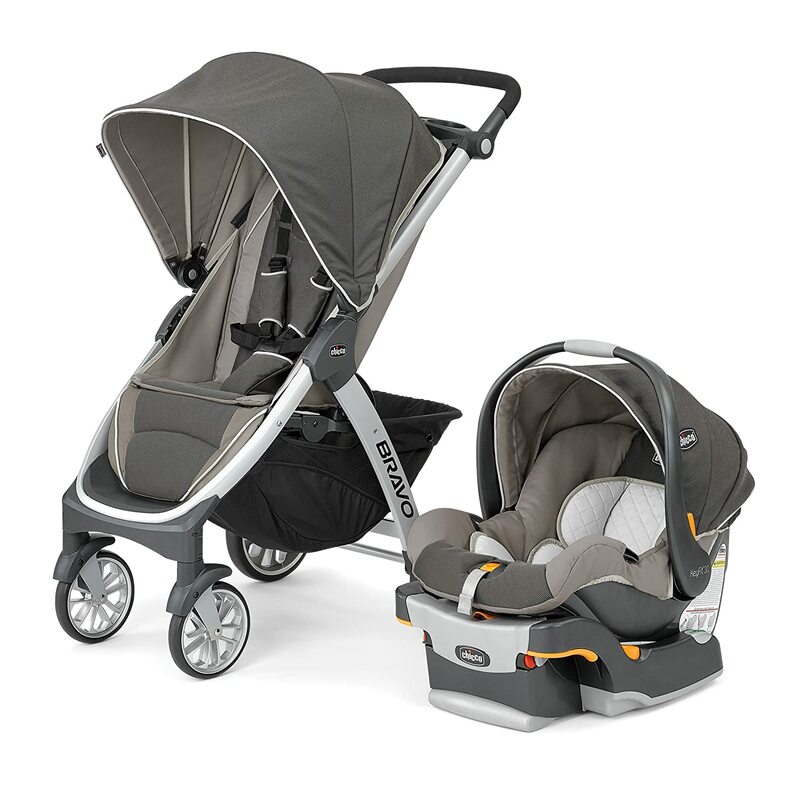 Every baby seated in this travel system will experience a comfy and smooth ride. The same can be said for the car seat, which is equipped with soft padding, multi-position recline and an adjustable five-point restrain. The oversized canopy and visor are made of special fabric which prevents sun rays from hitting your little one’s eyes. If there has to be one disadvantage, it would be the big size and weight of this product, which makes it challenging for frequent trips up and down the stairs. The stroller also features an enormous basket which can handle stuff of up to 30 lbs. – making it the travel system with the biggest capacity on the market. So whether you use it as a stroller, a car seat or a base, you should know that the UPPAbaby Vista offers a great value for every dollar spent on it. 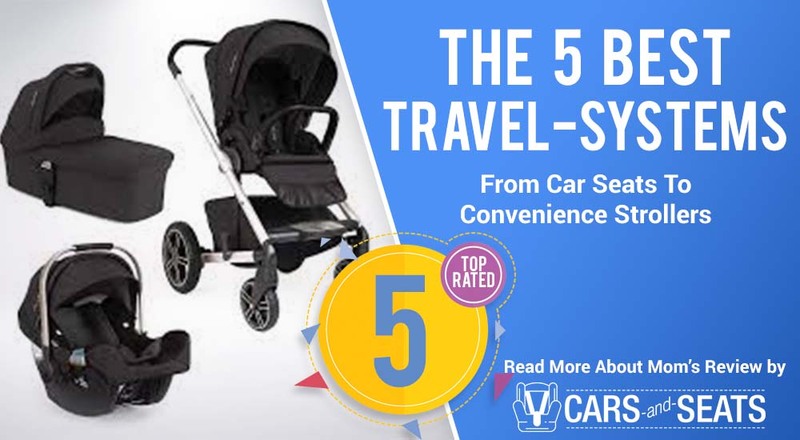 This is one of the best selling travel systems online – offering a great set of features which can hold an infant from 4 to 35 lbs and up to 32 inches in place (on the car seat). The travel system comes with the Graco SnugRide Click Connect 35 Infant Car Seat. The Graco Aire3 travel system gives parents everything they need when they are with their children. 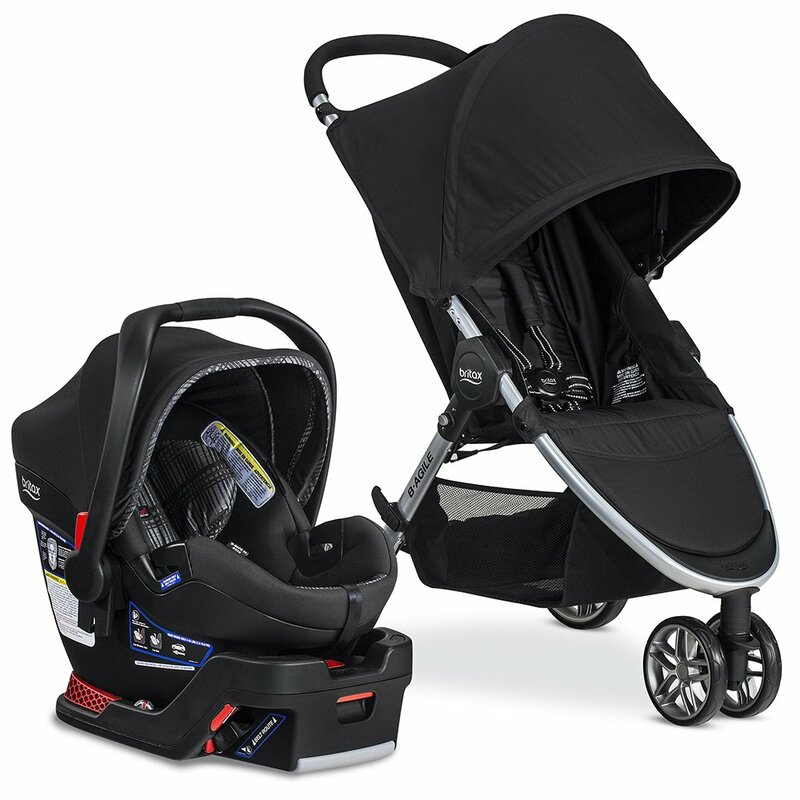 The easy switch between car and stroller makes this product functional and easy for parents. In fact, all that it takes for this product to change from a stroller to a car seat is a few seconds. With 3-wheel construction, this Graco travel system is amazingly maneuverable and agile. There is a built-in suspension for a smooth ride and the stroller works best on flat surfaces and handles sidewalks pretty easy. Thanks to the seat-reclining feature, the travel system creates an infant carriage for babies who cannot sit straight yet. In a nutshell, this is one of the best light travel systems that is perfect for you. The stroller weighs only 22 lbs making it super easy to transport or carry thanks to its shoulder strap. The folding is also super-easy and there is even an automatic lock with self-stand. Plus, the travel system is easy to store in a closet, garage or car trunk which makes it perfect for parents who drive a lot or often take their little ones for day trips. The only disadvantage is the fact that this travel system may be too low for tall people and that the underseat basket is rather small for storing more than just light products. However, this is still one of the most practical travel systems on the market. A lot of that has to do with the price which is super affordable and gives you a set of functional features – and your baby maximum comfort whether they sit, sleep or nap during their journeys. This travel system is the perfect mixture of the B-Agile Stroller and the B-Safe Elite infant car seat. These two products can also be bought separately – but are best bought together allowing fantastic maneuverability and amazing features. Thanks to the pivoting front wheel, you can easily fit through narrow spaces. The steering and turning around corners (and dirt roads) is also convenient even if you use one hand to push the stroller. With a frame made of aluminium, both parts are easy to lift and carry. We all know that day trips require a lot of luggage – which is why every parent needs a travel system that is lightweight. Whether it’s a trip to the zoo or the museum, there are times when you need to focus on having fun with kids and storing everything you have in one piece of gear. 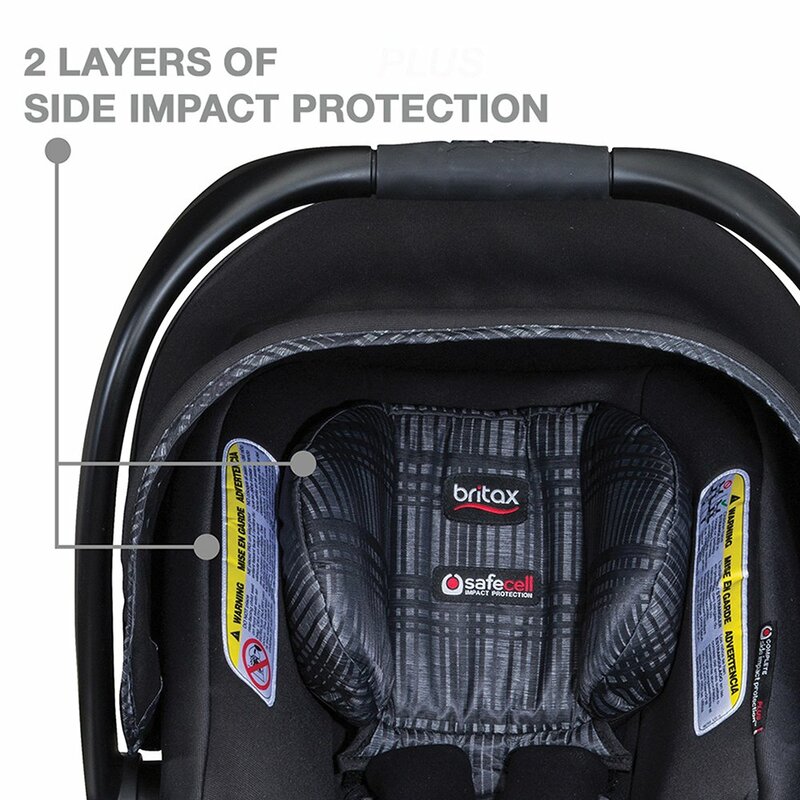 The Britax travel system is perfect for that as the seat itself has nice ventilation with a canopy that protects your loved ones from the sun (even in 50+ UV conditions). Designed to absorb energy and protect the baby during a collision, this is also a travel system that meets all the safety standards. Since it has the shape of a shell, the car seat is deep and features curved sides which keeps the baby in a stable position with minor side-to-side movement. The head protection is another bonus and there is an adjustable no-rethread harness for the best possible fit. The seat’s weight may be the only disadvantage here. However, the overall weight of the travel system is impressive and the construction is solid which is what matters in the very end. So, if you are looking for a product that protects your baby both in the car and when strolling around the city, this is one of the most affordable travel systems you can get. As you have seen from the above listed reviews, buying a complete baby travel system is a cost-effective decision. The best travel systems in 2018 cost a few more dollars than the best baby car seats – which is why they are a smart investment and a combination of baby gear that you will use daily. The only disadvantage to a travel system is the fact that you need to constantly install and uninstall the base to the stroller (or in the car). However, if you are not taking many daily trips with the stroller, this is definitely not much of an issue.